An American Wheat, brewed with malted wheat, lemon zest and grains of paradise - a rare pepper from Africa first used as a brewing spice in the 13th Century to create a crisp and spicy flavor and body. A- Lemon with a slightly spicy wheat aroma. Smells like exactly what I need on this awfully hot day. T- A nice balance between wheat and lemony flavors. The lemon is wonderfully refreshing and does not have a gross chemical taste that some other beers get from using fruit extracts. Finishes dry and leaves a lemony wheat aftertaste. M- Light bodied high carbonation. D- Just washed the car, it has to be 97F outside. This is just what I needed. A great summer beer, in fact I'd probably drink this even if it wasn't summer. On tap... Don't really remember where, but my guess would be some place without a thriving craft beer selection. Pours a golden-yellow color with an apparent, unfiltered haze that blocks a good amount of sunlight through the body. Big, chunky head settles on top, leaving behind a few good morsels of measurable lacing. It takes a while for the beer to warm and reveal a decent nose... it's mostly a combination of earthy and musty hops with a hint of wheat and some very faint citrus zest. Kind of a standard "pale wheat ale" smell. While not bad or off-putting, it's quite muzzled and doesn't really obtain high levels of interest or integrity. It's just "there" and fairly "meh" all around. The taste is similarly acceptable - following the whole "not bad but not great" persona. The palate opens up some brighter citrus notes like lemon rinds and orange flesh with the earthy, musky hops still heavy in the background. Again, there isn't much else to say about this one because it comes off as pretty neutral all around. Perhaps the best thing about the beer, or at least the most stand out quality is the mouth feel. Pretty crisp and refreshing while maintaining a nice softness, most likely from the wheat. Carbonation from the tap was at a nice level as well, making this light flavored beer go down even better, especially with a nice sirloin. All in all, nothing gross about this one, just nothing exciting, either. I wouldn't go out of my way to pick it up again, but I wouldn't be offended or go all "Beer Advocate" on someone if they offered me one. I can see this being a good way to convert non-craft beer people into the craft world... but given the seasonal release and style, I would recommend Oberon much more than this. Good solid beer but nothing incredible. 12 fl oz brown glass bottle served into a standard hefeweissbier glass in low altitude Los Angeles, California. Reviewed live. Expectations are moderate. A: Pours a one finger head of no cream, bad thickness, and terrible retention (maybe 15 seconds at best). Colour is a transparent gold. Sm: Light wheat, stale lemon, and light hops - maybe cascade? A mild strength scent overall. T: Lemon grass, light wheat, and bad citrus ester hops. Light spice is present, which doesn't help the already poor balance. It's built strangely and poorly. I don't really care for it. Simple and a bit bland, if not slightly watery. The finish is poor. Mf: Smooth and wet, and a bit too thick for the relative lack of flavour. Doesn't really suit the flavours. Dr: Drinkable but low quality. The price is high considering the poor quality. Pours a 6 finger wide head of off-white colour. Retention is great - easily ~7-8 minutes. Body colour is a hazy bright copper of average vibrance. Aroma: Vague citrus, including lemon zest. Wheat. Some spice. Grassiness. I find Grains of Paradise when I search for them. Floral notes. A muted aroma of average intensity. No yeast, alcohol or off-notes are detectable. Taste: An unbalanced mixture of vague notes of lemon, grains of paradise, grassy and faintly floral hops, and wheat. Not gestalt, not particularly cohesive, and not complex or subtle. Duration and intensity of flavour are average. Texture: Unrefreshing. Smooth, wet, overcarbonated. Medium-bodied where it should be light-bodied. Overcarbonated. Overall: A drinkable forgettable wheat ale with no redeeming characteristics. It'll get you drunk. Why hasn't Sam Adams retired this? 355 ml bottle served fairly cold into a pint glass. Purchased as part of a six pack so it works out to about $2.30 CDN for a bottle. Advertised as 5.5% ABV and fresh until June 2016. Appearance - hazy and slightly orange in color. Nice finger plus of fluffy white head, some lacing to go along with good retention. Smell - plenty of wheat, light citrus although there's also a sulphur aroma in there which is a bit strange. Not a big nose either. Taste - wheat, apricot and maybe some peach. Mild bitterness as the sulphuric smell doesn't really show up on the taste buds. Mouthfeel - smooth, creamy, medium-light body and moderate carbonation. Am easy drinking brew. Overall - not a wow beer, but solid, drinkable and pretty light. A bit pricey for what you get, but it's not half bad either. Worth a shot. I am sure I will catch some flak from the more elite beer drinkers, but this beer is my all time favorite summer time beer. It has an amazing summery taste and feel for me and I look for it every year. The hint of citrus is just right without being overpowering as some beers do. This is a great beer and the best summer beer I've tried. I graded it based on summer beers, not against every beer out there. I enjoyed this summer ale, though it's not the strongest flavor out there. Still a good choice though, and obviously widely available. Definitely a good session-style beer when it's hot outside. Tastes like your typical pale wheat, and one of the top comparisons for similar beers on this site is New Belgium's Snapshot, which makes sense to me. I'd say they're pretty equivalent, though I liked this one a bit more. Decanted from a 12 oz (355 ml) bottle into a conical pint glass; best by Oct 2017. A: Pours a hazy, dark golden color with a half inch head with low retention and lacing. S: Aromas of cloves, toast and pepper initially with a more sour citrus smell later. T: Dry with cracker taste; acidity leads to a crisp refreshing finish. Light bitterness in balance. M: Surprisingly full bodied with solid effervescence well into the pour. O: I have had many "summer ales" too many of which are truly subpar. Some adulterate with too much lemon or fruit or try too hard to be "fun." Perhaps something like a Belgian wit with characteristics of a sour ale, this is a refreshing, subtly citrusy and drinkable. Would do well on a hot beach day. 12 ounce bottle poured into a Samuel Adam Perfect Pint glass. Appearance: Light, translucent gold, with a great many fizzy bubbles. Produces a tenacious two fingers of head when poured. Smell: Sweet and malty, with a hint of lemon. Taste: An interesting, evolving flavor. Initially, you get a slightly dark flavor from the malts, with strong presence of honey. Then, the flavor becomes much lighter, and the mild hops and yeast come through, with lemon bread, a Hefeweizen-esque hint of banana, and a refreshing, smooth finish. Sweet honey remains on the palate after the beer is swallowed. Delicious, and indeed very summery. Mouthfeel: Substantial for a wheat ale, with a soft, marshmallow thickness, likely due to the strong carbonation. Overall: This is hands-down one of my favorite offering from Samuel Adams. It has complexity without being overbearing, and is tasty and quaffable. The next time I have a cookout, I'll be stocking this in the fridge. On draught at a steakhouse. Cloudy yellow with thin head and no lacing. Good floral smell. Light pleasant taste of lemon and grass. It went well with the steak and ribs. 355 mL single bottle from the LCBO; best before May 2013 and listed at 5.5% abv. Pours a cloudy straw yellow with a slight orange tinge. Seated atop is one finger of frothy white head that quickly vanishes, leaving behind a soapy film on the surface and a creamy collar. The aroma is a bit muted, but otherwise enjoyable - bready wheat malts are a little too dominant, with lemon citrus and peppery spice struggling to be detected through the malty sweetness. Actually a bit tastier than the aroma let on. Bready wheat malt sweetness comprises the backbone, with notes of honey, lemony citrus, white pepper and herbal, grassy hop dryness coming forward during the sip. Spicy, grassy finish that scrubs the palate clean and doesn't linger long. On the light side of medium-bodied, a bit of chew with heavy, biting carbonation; almost a bit too high, but it works well here with the spice so I can dig it. Easy to drink quickly, and a perfect summer patio drink. I wasn't sure about this stuff, but the first sip intrigued me enough to look a bit further. This is a seriously great summer refresher, with just the right levels of lemon zest, spice, and chewy wheat sweetness. I decided to just get a single bottle of this rather than an entire six-pack, but I am sort of regretting that decision having tasted it. Final Grade: 3.8, a solid B+. Easily one of the best American-style wheat ales available in this market. I tend to be more of a hefe/wit guy, but this is a nice changeup that I wouldn't hesitate to recommend, or purchase again. A solid brew that is well worth picking up, particularly if you are a fan of wheaty beers in general. Another lackluster beer by Sam Adams that offers nothing. It tastes like a droning college lecture. I did not care for the aroma of this beer at all. The slightly alcoholic lemon smell reminded me of bathroom cleaner. Summer Ale poured a bit cloudy and dark yellow, almost amber, with a full and faintly off-white retentive head. This brew has a distinct "bite" when first sipping it, perhaps from the grains of paradise, which quickly fades to a sour lemon flavor, and then a faint hint of wheat in the aftertaste. A quality brew, as can be expected from Sam Adams, but one which I am personally not fond of. The grains of paradise might be interesting, in a different brew, but the sour lemon turned me off. I would not buy this beer again, simply as a matter of personal preference... others may enjoy it. 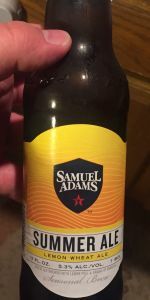 Jim Koch, the founder of Sam Adams, writes on the back label, "When you pour a Samuel Adams Summer Ale into a glass, you'll notice slight haze in the liquid. This is intentional. We achieve more body and mouthfeel by not filtering this wheat ale." It's like they received so many complaints that the beer was clear and crisp that need need to explain themselevs to the consumer. I just thought this was funny. Tastes like a wheat beer mixed with dishwater. Disappointing compared to the so many other great beers by the Boston Beer Compnay. Poured a hazy amber with little head. This beer was served very very cold. I know that wheat beers should be about the coldest of them, but this was almost numbingly cold. The first few sips were refreshing though. Because of the temp, it was hard to pick up on much in the nose beyond the typical wheat and slightly hopped smell. As the beer got to a normal drinking temp, I was able to pick up on more of the citrus feel and more of the hop florals. As far as the drinkability goes, this beer can be sessioned as easily as anything. I started and finished a session off with this beer and really enjoyed it at both ends. For what this beer is, it's quite refreshing and does the job as good as any. A yellow golden color brew with a thin but stubborn head and moderate lacing. The aroma is pretty weak yet hints at a biscuit-malt blend. The taste reveals a bready and kind of woody flavor. Sort of dull but with a subtle complexity. A little tart from tongue to throat with a bitter finish. Pretty thin stuff, not much body. It's OK. Fairly drinkable, however, I wouldn't be too interested in more than one or two of these given some choice. Pours hazy amber with a small head. Nose shows orange peel, wheat, lemon and sweet clean malt. Flavours include wheat and lemon along with some vegetable characters and spices. Carbonation is a bit excessive really. Pretty weak, not all that interesting. Served on tap. Poured into a pilsner glass. A- pours a cloudy shade of gold with a 2 finger white head. No lacing. About average. S- weak smells of orange peel and lemon...good smells for this style, but they were very weak. M- its got a good feel, pretty light. Pours a hazy orange color with a bright white head. Orange rind and lemon zest on the nose. Bits of sweetened biscuits as well. Creamy mouthfeel with lower than average carbonation. Sweet fruitiness of citrus and orange. A bit grainy, some detectable wheatiness. Almost clove like finish with a very modest spicy hop profile on the back end. Big but slightly bland as well. I don't mind the taste it is unique but heavy for a summer seasonal. Would be really really good with breakfast though oddly enough haha. I guess its a good summer day started.